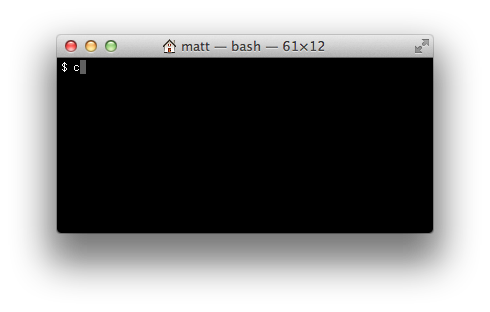 One quick productivity hack is to add command line aliases to your Terminal in Mac OS X. For example, I prefer typing c instead of clear to clear the terminal and I usually add all sorts of shortcuts for cd’ing into directories that I use often. 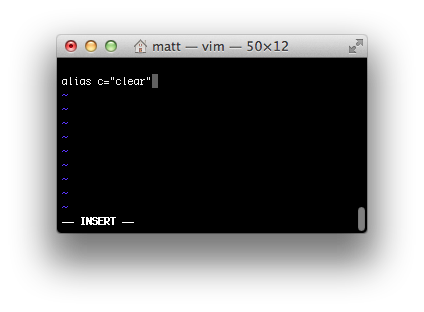 If you followed this example, you should now be able to just type c and Enter in Terminal to get the same affect as typing clear. For more information, this post gives some additional examples of aliases you can add. Posted on January 27, 2012 by Mazur. This entry was posted in Tutorial. Bookmark the permalink. you end up with a fairly similar result simply by typing “c” and up-arrow – a surprising number of the commands I use end up having 1-3 character unique prefixes, particularly within a session, which allows me to avoid having to create many shell aliases.